I have been scouting the water here at the pond at my apartment complex in Palatine for a few weeks and I noticed some big fish, and a lot of times they would be crusing along the edges of the pond. I was not sure what they could be, but I had a big thought that they could be Carp. I have caught a Carp last year in the same pond before so I had an idea of what they looked like and where they like to go. A lot of them were crusing under tress and such and seem to like the real shallow water. Wacky and I started fishing at the pond for the Carp about 11:30 and fished for about 2 hours before we decided that maybe we needed to check out other ponds for more action. We went to a few ponds but had no luck at them. I was determined to catch one of the Carps I saw at the pond at my apartment so we decided to go back to the pond at my apartment and started to fish there again about 4:30. I put bread and corn on the hook (Medium sized hook) and used a stick bobber with no weight and threw corn and cherrios in the water to get the fish's attention. 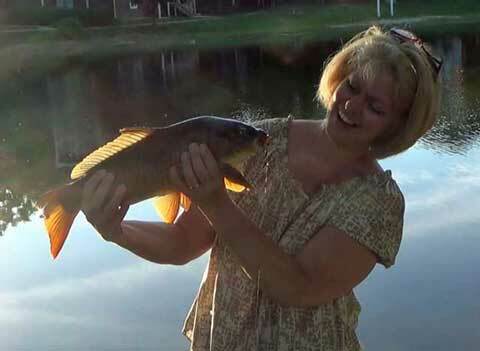 The cherrios were good for an attention getter because they floated and Carp like to feed on the top at times. Casted the line just a little past where I saw the Carp hanging out, and brought in a little towards them. Saw the bobber sink down a little , and then a little more and then.... the bobber was down. After that the hook was set and then the action began! Excitement! Tried to leave enough line slack so the fish could swim around a bit while Wacky Bass grabbed the net. Wow! It is hard work getting those critters out of the waters, but it is sure worth seeing what you have captured! I tend to get real excited when I catch something and I want to learn to control the excitement a little bit so I can control the reeling in better, but then fishing would not be as fun for me. Just with more practice I will get it and be excited too at the same time! Thank you my angler friends! You'll be chumming for carp like Pondboy soon!!! Congrats goofy. Sounds like you're having a lot of fun with those carp. Now you just gotta hook into a grass carp! Pondboy would probably be able to help you with that one. He conquered that beast last year.